Wausau, Wis. -- The City University of New York’s (CUNY’s) Borough of Manhattan Community College’s opened the Miles and Shirley Fiterman Hall at the beginning of the 2012-13 academic year. 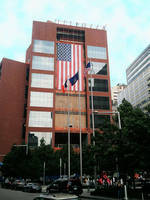 It replaces the original Fiterman Hall, which was irreparably damaged when World Trade 7 fell against it in the attacks of September 11, 2001. The new facility offers students the latest in educational technologies, first-class amenities and expansive views of New York City framed with high-performance curtainwall from Wausau Window and Wall Systems. After a 10-year construction process, Fiterman Hall opened in August 2012. The 14-floor building was designed by renowned architectural firm Pei Cobb Freed Partners and built by Hunter Roberts Construction Group. The new facility was certified under New York State Executive Order 111, which requires overall energy and sustainability improvements, with similar criteria to the U.S. Green Building Systems’ LEED® certification. Fiterman Hall’s student capacity tripled to nearly 25,000 students with the new 400,000-square-foot facility. The building’s most distinctive areas include its two-story glass atria on the north and south sides of the building. Each hasstacked atrium spaces with interconnecting, open, spiral stairs and student lounge areas. The atria house a fine arts center, a public café, and an interior grand staircase that ascends from the lobby to the fourth floor. Extrapolating on the idea of a red brick schoolhouse in a modern, urban, business district, Fiterman Hall’s southern façade showcases precast panels with architectural brick complemented by the openness and transparency of glass and aluminum-framed curtainwall. Helping translate this vision, Wausau manufactured and shipped nearly 71,000-square feet of unitized curtainwall for installation by Staten Island, N.Y.-based glazing contractor Genetech Building Systems, Inc. Engineered for high thermal performance, Wausau’s 7250i-UW and 10250i-UW Series curtainwall are optimized for energy efficiency with a polyamide nylon structural barrier. These unitized systems are manufactured in ready-to-install units that span vertically from floor-to-floor. Along with saving time and labor in the field, this approach reduces dependence on weather seals and accommodates dynamic movements without placing undue stress on glass, sealants or other infills. As the curtainwall units are pre-glazed under controlled conditions at Wausau’s LEED Silver-certified manufacturing center, rather than at the job site, customers can be confident that the systems achieve their intended performance. Wausau also provided its 3250 Series windows as fixed over in-swing units for Fiterman Hall’s second floor workspace area. These windows are rated as AAMA AW-70 Performance Class and are labeled by the National Fenestration Rating Council (NFRC) for energy performance. Viracon supplied the insulating, Low-E glass for both the windows and the curtainwall. Beyond high thermal performance to meet energy-efficiency needs, Wausau’s systems’ composition supports New York’s environmental and sustainability goals. The curtainwall and windows’ aluminum frames contain recycled content averaging 70% or greater. The recycled aluminum framing is painted by Linetec in a gray for the shadow box metal and Champagne Metallic for the curtainwall. Both use a Duranar® XL fluoropolymer coating containing a minimum of 70% PVDF resin. This three-coat system meets requirements of AAMA 2605, the most stringent, high-performance specification for architectural coatings, to withstand the urban environment and maintain the college’s enduring high-profile appearance.